Eric Naivasha heads the Energy & Environment pillar at Equity Group Foundation in Kenya. He oversaw the development and digitization of the EcoMoto loan product, an innovative financing facility for customers to acquire solar home systems and cleaner cookstoves. He also spearheaded the establishment of a distribution network for solar and other clean energy products leveraging on Equity Bank’s wide infrastructure, multi-product distributors and manufacturers/suppliers networks covering most of the regions in Kenya. 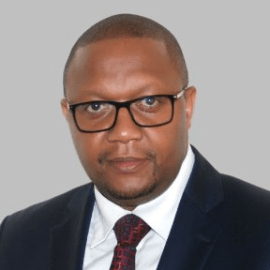 With experience in banking and clean energy sectors, Mr. Naivasha has a unique blend of expertise that allows design of innovative financial products for solar products and renewable energy in general. Before joining Equity in 2016, Naivasha worked at other senior positions including the Royal Dutch Philips as the BOP Venture Manager for Africa, Managing Director at K-Rep Advisory Services in Kenya, Managing Director at Centre for Microenterprise Development (CMD) in Nigeria, Investment Director for Africa at Catalyst Microfinance Investors (CMI) and Regional Director for MYC4 A/S. Mr. Naivasha holds Master of Science degree in Economics from University of Zimbabwe, a BA in Economics from Moi University Kenya and numerous short courses in finance.